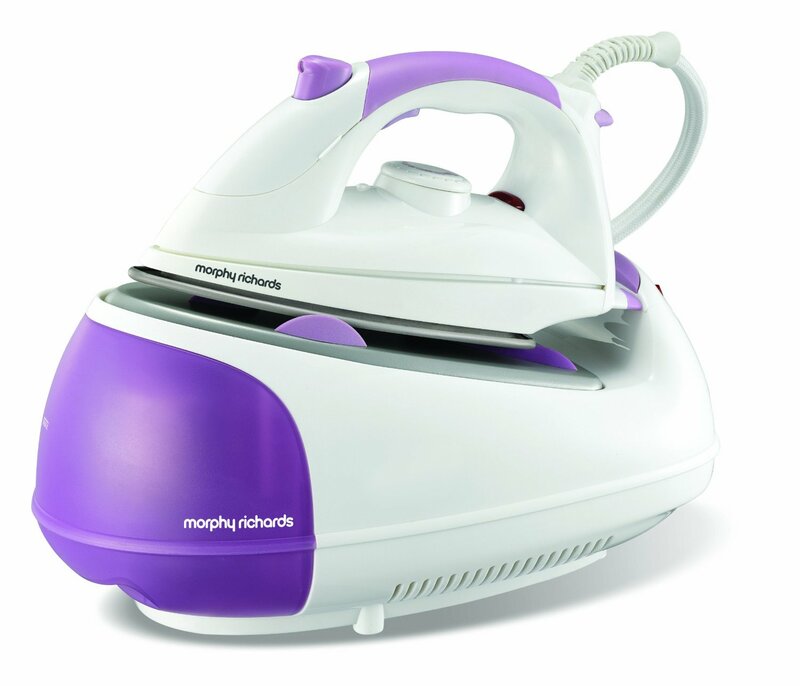 £100 is the average price point for the Morphy Richards 42244 Jet Steam Generator Iron across the UK and it makes this iron a really great choice for many people. That is a price drop of about £20 since this time last year. With over 1,500 online buyer reviews, this tells us that this is a consistent best seller on many websites and in Retail stores throughout the UK. I also like the appearance of it as it is easy on the eye, and I think it just looks good. 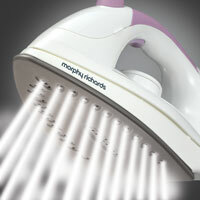 It is certainly very good quality and I also like the Morphy Richards brand a lot. This is also a newer and improved model of the 42234. There are a lot of features packed into this iron so we should have a look at those in a lot more detail. Some of those make your ironing a lot easier and some of them save you time. Either way if you have only used a normal steam iron before, this is a whole new world of faster and simpler ironing. For those who do not have time to read my full review below, then please click on the button below. That will take to to Amazon, where you can check out a lot more information. There are a couple of important features that you should look out for on any iron and none is more important than the soleplate. That is what will come into direct contact with any clothes that you are ironing so it better by of very high quality. It should be designed so as it does not either burn or snag clothes. You also never want it to be spitting out any rust spots that may have built up over time. 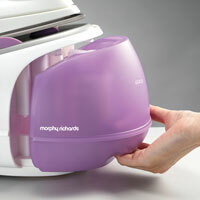 In this 42244 model Morphy Richards have used what they call a diamond soleplate. This surface allows your iron to glide over your clothes and makes sure that nothing will get ruined. All irons need to be filled with water and steam generators use more water than most ordinary irons will ever do. This model has a 1 litre tank which you can detach and then fill up at the tap. In simple terms the less trips you have to do to the tap the better. You can simply focus on doing the ironing and not have to run back and forth filling up the tank. This 1 litre tank has a boiler that is continually filled so you don’t have to wait on any new water heating up. That speeds things up quite a bit. Always make sure that whichever iron you decide to go with that the tank is easy to remove and it is portable. You always want to be able to detach and bring to the tap, rather than have to bring the water to the tank. The more expensive irons do tend to have a larger tank than this one. This is what is used to do items like curtains, dresses and suits. You simply hang the item up and then allow the steam from the iron to do the work. It is a really nice little feature to have, and great for keeping your curtains in top condition without having to take them down and then put them back up again. It is also really handy for doing business suits, dresses and school uniforms. Any iron will need some maintenance but the less that you have to do the better. This one uses an anti-scale cartridge that you simply remove and replace and that will make things a lot faster. This package comes with one cartridge already fitted and one spare. Do remember though that you will have to buy replacement cartridges to keep your iron in good working order. This is the best selling product so you would expect this model to have very good reviews and indeed it does. When you see 1,000+ reviews at Amazon with an average rating of 4.4 out of 5 stars then you know you are buying a very good product indeed. Excellent product that cuts down the time of ironing by half and irons better than your conventional iron, definitely worth buying! That pretty much sums up this iron. if you have never used a steam generator before, I think you will be quite amazed at the difference in the speed of your ironing. Rather than topping up your iron with some silly little plastic funnel or a jug, you just fill up this tank and get cracking. The steam generated is more powerful and a great deal higher than anything you have been used to in the past. Steam is the key to fast and effective ironing. For years the price point has put many people off. This one is however at the lower end of the price point, and is of very good quality. Typically these are about 3-4 times more expensive than a traditional iron but they also last longer and save you hours of time. They are also a lot easier to use in my opinion. If this is not the right Morphy Richards Iron for you, then why not check out our top 10 list of all the Morphy Richards steam generator irons by clicking here. This model however is at a very affordable price of around £100-120. 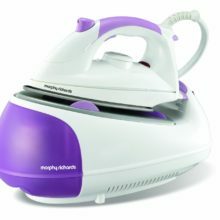 So if you want an introduction to the world of easier ironing then get the Morphy Richards 42244 and find out for yourself.